On April 28, 1915, a little over a century ago, in St Brigid’s Catholic church at Wynyard in northern Tasmania, Tasmania’s Treasurer and Minister for Railways and Education, Joe Lyons, aged thirty-five, married his seventeen-year-old sweetheart, the newly graduated teacher Enid Burnell. It was a very special union. The celebrant at the wedding was Father Tom O’Donnell, a good friend of the groom, and the priest who had presided over instruction to the Methodist-raised Enid before she converted to become a Catholic a month before her marriage. The conversion had its own uniqueness. O’Donnell, who did not impress Enid, was called away. Enid’s mother Eliza Burnell believed it was important for a couple to hold the same faith. At the presbytery, she urged her daughter to read the Catholic texts. In the end, it was Methodist Eliza who converted Enid to the Catholic faith. Less than two months earlier, on the eve of Enid and Eliza’s departure for O’Donnell’s presbytery in Stanley, the Burnell family’s Methodist preacher had pleaded with Enid not to give up the “faith of your father”. Enid also recorded that her grandmother had “disowned” her mother for allowing her to marry a Catholic. And she had had no pre-wedding parties due to the similar disapproval of her Methodist girlfriends. Subscribers had no need to wait for our paywall to open. The union of Joe Lyons and Enid Burnell, its timing, its success and its many contexts, says as much about Australia as the characters of Joe and Enid. 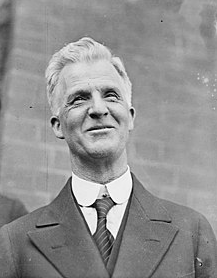 Joe Lyons, who became Prime Minister in January 1932, was Australia’s first prime minister to have a parent born in Australia. Earlier prime ministers either had parents who were born in the United Kingdom or were born there themselves. This small fact says a lot about the extent to which Australia remained, even after federation, so genetically linked to its mother country. But there is another distinction to be made. 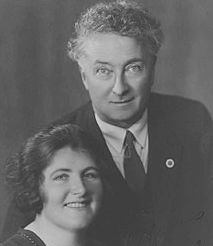 Joseph Lyons was the son of an Irish-born mother and the grandson, on his Australian-born father’s side, of immigrant Irish settlers to northern Tasmania. In Australia at the time, Catholic Irish immigrants made up a significant minority—about a quarter—among a Protestant-dominated majority. In Tasmania, they made up even less, at around a fifth. within the Catholic community there was a suspicion about the links with England and a conviction that the Australian colonies should be something different—more like American society, perhaps, where so many of their relatives and coreligionists were flourishing … Australian independence and nationhood became a rallying call for many Catholics and people with no religious allegiance at all. Along with Jim Scullin—the son of Catholic Irish immigrants to Australia who assumed office as Prime Minister in October 1929—Lyons was to be a trail blazer for Irish-descended Catholics at a time of Anglo ascendancy in Australia. Yet, in the case of Lyons, the history books so often overlook this fact. Lyons’s leadership of the United Australia Party gave Australian Catholics their first taste of voting beyond their tribal Labor origins. He also offered a way to be loyal to Britain while supporting a proud Australian nationalism. As Catholic Labor politicians, Lyons and Scullin (right) could, in part, thank their Labor Party membership for their achievement of rising to highest office—Lyons as Tasmanian Labor Premier in 1923 and Scullin as Labor Prime Minister in 1929. Before the Labor split of 1916, the fledgling Labor Party was predominantly Protestant. For all that, a handful of Catholics, like T.J. Ryan in Queensland, Lyons and Scullin, had made their way into the parliamentary party. The greatest achievement in this trail blazing, however, was that of Joe Lyons. In December 1931, as leader of the United Australia Party, he led a Protestant Anglo collective to a landslide victory against Labor. At that moment, the sectarianism that had so dominated Australian politics, especially since 1916, was swept aside. Pragmatic politics has defined Australia. While global dogmas have fomented revolution and far Left and far Right regimes elsewhere, Australia has—despite its connections to the old world—maintained something of a survivor’s common sense. While there have always been many groups who justifiably protest against discrimination, the Australian mainstream has tended to vote for pragmatism over ideology more often than not. Maybe it is the rugged nature of Australia’s continental experience; maybe it is just a laid-back, working person’s sense of getting reasonable outcomes. The decades in which Joe and Enid Lyons matured and came to public life were decades where, through education, hard-working settlers like the Burnell and Lyons families bridged the gap between penny-pinching survival and modest middle-class comfort. Joe Lyons, whose father lost the family business in Ulverstone after betting his life savings on the 1887 Melbourne Cup, had been sent to work as a printer’s devil at the age of ten. He was saved only by his spinster aunts, who eventually sent him back to school, where he rose to become a monitor teacher and later a graduate of Hobart’s newly opened teachers’ college. For the Burnells, it was only Eliza Burnell’s scrupulous saving over the years that enabled Enid Burnell and her sister Nellie to also attend teachers’ college in Hobart. In the early 1900s, Catholic Joe Lyons and Methodist Eliza Burnell (Enid’s mother), for all their differences of faith and the sectarian divisions of the time, found themselves colleagues in the labour movement of northern Tasmania. For those committed to the cause of struggling working families, politics overrode faith or church alignments. It was this connection that in time introduced Joe to Enid. Underpinning much of the antagonism between Catholics and Protestants was the backdrop of the British occupation of Ireland. And yet, while Joe’s Irish-born mother and her sisters in Stanley were central to his upbringing after his father’s demise, in Lyons’s speeches and brief recollections of growing up, what shines forth is his concern for the people and the country that made him. Lyons was stirred by the injustices of low wages for hard toil, the untrammelled power of Tasmania’s Legislative Council, and the denial of education and medical benefits to those who could not afford to pay. In his early years as an MP, Lyons supported the Closer Settlement program under which the government bought up older estates to divide into smaller allotments for new settlers. And, in Enid, Joe Lyons had found the perfect partner. In time, with her growing brood of children (below), alongside her devotion to Joe and her mother’s Labor Party, and her instinctive understanding for mothers and children, Enid would somehow become more Catholic in character than her husband. All the while, she could charm an audience of mixed faith backgrounds from a podium. On March 25, 1916, Labor lost the Tasmanian state election. Joe and Enid began building a house in Devonport while Enid expected the birth of their first child. A month later, at Easter in Dublin, a rebel Irish “Brotherhood” of some 1200 to 1600 began an uprising that held off British forces for over a week. By the end of that week, British forces in Dublin numbered 19,000. In the years that followed, Britain would station 50,000 troops in Ireland, depleting its forces in the war against Germany. Some Irish militants had signed up with Britain’s enemy, Germany, while British troops were being slaughtered by the German army in France. But some 80,000 Irishmen would be part of the UK’s forces and many of them were among the dead—3500 Irish would die at the Somme in 1916, 1200 from the south. That the leaders of the Rising faced execution within days of their surrender was not surprising—they were facing British firing squads just as British deserters did. But, while there had been little support in Ireland for the Rising in Dublin, the summary executions of the rebel leaders changed emotions. By May 11, Irish Nationalist MPs in London were demanding answers from Prime Minister H.H.  Asquith and challenging the government’s handling of the aftermath. In far-off Australia, the shock waves of the Easter Rising were muted by Australia’s distance and involvement in the war effort. As one, government, churches and public opinion condemned the Irish rebels as traitors and troublemakers. Those in Australian Catholic communities who supported John Redmond’s Nationalists lamented the work of the rebels for ruining what was a peaceful means to Home Rule being forged by the government at Westminster. But with the Rising—however much Australian Catholics of Irish descent would protest their loyalty to the empire—many non-Catholics would now mark out the Irish Australian Catholic minority as being on the side of traitors. On Monday, May 1, 1916, Australia’s Governor-General, Ronald Munro-Ferguson, spoke for all in a cable to the Secretary of State for the Colonies. The cable expressed deep regret from Australia “at the rebellious outbreak in Dublin”. He added that he was confident “the great bulk of Irish people disavow and deplore the proceedings”. He assured the Secretary of State that “Representative Irishmen here, as well as Roman Catholic bishops, all Irish born, denounce and repudiate the criminality of the Dublin fanatics”. After the Dublin executions, Melbourne’s Catholic Advocate published a lengthy piece on the Sinn Fein actions, arguing that part of the problem was Britain’s inability to govern Ireland properly. Britain should never have allowed Edward Carson to raise an Ulster volunteer army. The article, however, supported the crushing of the rebellion. As Patrick O’Farrell has written and demonstrated in The Irish in Australia, “the big Irish questions in Australia were the ones that raised Australian questions”. In 1916, Australia had been a nation for barely a decade and a half. A struggle had begun, pushed by the Catholic Federation, over the lack of government aid to Catholic schools—aid which had been removed under the colonial education acts of the late nineteenth century. 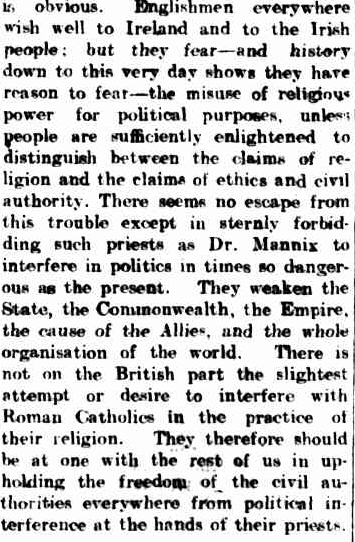 Archbishop Daniel Mannix in Melbourne would in time be in favour of the Federation forming its own Catholic party. Nonetheless, Irish Catholic Australians proved loyal to the British Empire, and had enlisted as heroically as any when war broke out in 1914. But the war would—as it had in Ireland—bitterly divide Irish Catholic from Anglo Protestant. In Australia, the aftermath of the Easter Rising engendered sympathy for the executed rebels and soon translated into a Catholic-Protestant divide over the Hughes Labor government’s desire to raise greater numbers of troops to support the war effort by means of conscription. As the conscription debates took hold of the nation, increasingly those opposing conscription were labelled as disloyal to Britain and the empire. The Labor Party divided bitterly into pro- and anti-conscription forces. Catholic Labor members opposing conscription were not helped by the prominence in the 1917 anti-conscription campaign of Dr Mannix, Melbourne’s Irish and newly installed Catholic archbishop. As a result, hysteria over Australian German residents soon became anti-Catholic sectarianism—the accusation in both cases was disloyalty to Britain and the King. Joe Lyons and Jim Scullin were caught up in the ensuing struggle. Their experiences chart much of the fallout of the Easter Rising for Australians. Unlike tribal leader Dr Mannix, fresh from Dublin and undeterred by Australian sectarian bitterness, Lyons and Scullin were part of a political party that shunned accusations of partiality to sectional interests. Members of the Catholic Federation were debarred from joining the Labor Party. In Hobart, the Mercury was known for its sectarian, anti-Catholic sentiments and, even before the conscription debates, had pushed the views of prohibitionists against “disloyal” Irish Catholics as the debate over closing hours for pubs heated up in 1915. The King after all had pledged to abstain from alcohol and, as many loyalists saw it, Catholics maintained true loyalty only to the Pope in Rome. In 1916, Tasmania became a hotbed of sectarian politics, ending with a splintered Labor Party. Families and party were torn apart over conscription during the plebiscite campaign in September and October 1916. The year ended with the removal of Tasmanian Labor leader John Earle, who had supported Labor Prime Minister Billy Hughes, and the election of anti-conscriptionist Joe Lyons as the new Tasmanian Labor leader. Lyons had had pacifist leanings all his life but his opposition to conscription was not opposition to the war, its cause or to Britain. He held none of the anti-British sentiments to be found in the arguments of Daniel Mannix. Increasingly, Mannix would intensify his opposition to the war and British forces in Ireland. Lyons’s argument, as put to the parliament in early September 1916, was that he accepted that Australia needed to send more men to the front but that Australia “had reached the limit so far as recruiting was concerned”. He also refused “to get up and tell men they ought to enlist”. He spoke for a majority in the Labor Party at the time but faced many rowdy meetings and at one point was almost thrown off a bridge at Deloraine during the conscription campaigns. At the 1919 Tasmanian state election, Lyons had to fight off not only sectarian attacks but also growing pressure on Labor to accept the demands of the Catholic Federation for state aid. The result of this battle on two fronts was the loss of a Labor seat in the thirty-member Legislative Council. But Lyons succeeded in leading Labor through the sectarian years largely from his pragmatic approach. By October 1923, when the Lee government lost a vote in the House and Labor fell into government, making Lyons Premier, he had long recognised that his responsibility was not just to lead Labor but to offer a style of management that would lead a state. Even as vice-president of the United Irish League in 1916, Lyons worked to keep his religion out of his politics. His arguments in support of Home Rule for Ireland were always that this was a political stand, not a religious one. This did not endear Lyons to tribal Catholic leaders like Mannix. For Lyons, the outspoken and divisive Mannix rallied the hopes of his Catholic adherents but also provoked an unhelpful sectarian backlash. Catholic working-class men found themselves discriminated against for employment. In Victoria, Jim Scullin faced a similar political dilemma. Both Lyons and Scullin argued the anti-conscription case in states that voted “Yes” in 1916. In 1917, Victoria swung to “No”. Both Lyons and Scullin supported Labor’s opposition to state aid for Catholic schools. They saw the actions of Catholic pressure groups as adversely affecting Labor’s appeal, especially after the Labor split following the 1916 plebiscite when Labor suffered an exodus of non-Catholic members who went with Hughes. With the Easter Rising, Scullin showed no indication that he supported the rebels. But he did change his perspective as shocking reports of the Black and Tan attacks on Irish towns and citizens began to emerge in post-war years. He joined protesters when the British government prevented Daniel Mannix from landing in Ireland in 1920. And he gave publicity to Sinn Fein writings as editor of the Ballarat Evening Echo. Chief among both Lyons’s and Scullin’s arguments about Ireland was that the divide was a nationalist one of freedom from British rule—it was not a case of Catholic against Protestant. But the civil war that broke out over the treaty, in 1922, would confound Australian supporters of Ireland. Like Irish Australians in general, Lyons and Scullin lost interest in the Irish question after 1922. Switching to federal politics at the 1929 election, Joe Lyons represented the federal seat of Wilmot as a Labor MP. He was part of the Scullin government—a Labor government after thirteen years in opposition. The Scullin government was immediately rocked by the Wall Street crash and the credit squeeze and depression that followed. Lyons found himself Acting Treasurer and facing uproar in caucus over monetary policy. British creditors could no longer be relied on and, in late 1930, Lyons found himself working with Victorian Nationalist Robert Menzies and Melbourne stockbroker Staniforth Ricketson in a campaign to raise more than £28 million from ordinary Australians to finance a loan conversion. The loan was in the end oversubscribed. This unorthodox cross-party strategy saved the loan and marked Lyons out as a politician who could reach across party lines in a time of crisis. The Labor Party caucus, however, was on a self-destructive track, besieged by followers of New South Wales Premier Jack Lang’s populist belief in reckless spending and torn by ideological warfare at a time of financial disaster. The upshot was that Joe Lyons and a handful of Labor colleagues decided to split with Labor over Ted Theodore’s fiduciary note legislation. On March 13, 1930, Joe Lyons made his last speech as a Labor man. A ‘Million Pound Note’ election flyer from the 1931 campaign, after Joe Lyons quit Labor. In the months that followed, Lyons and his small band of Labor splinter colleagues linked up with the Nationalists to form a new party known as the United Australia Party. Lyons was actually elected to lead that party in a Nationalists’ party room meeting at which he was not entitled to be present. It was a most unusual political arrangement. Of the seventeen men who made up Joe Lyons’s first ministry in January 1932, just one was a Catholic and he was the prime minister. Catholics might have made up around a quarter of the Australian population but the United Australia Party MPs were a conglomerate of Anglo Protestants. For the most part, Catholic Labor had gone with the anti-Hughes Labor group at the Labor split in February 1917. The Nationalist Party thus was formed by uniting Hughes’s breakaway National Labor MPs and the Anglo-Protestant Liberal Party of the time. That Joe Lyons with his public-spirited Catholic wife and their brood of ten children, one in a basket joining his parents on the 1931 election campaign trail, should be the first minister of such a collective says much about the Lyons couple and the country they led. But the men of the back rooms who had lured Joe Lyons to their side—Staniforth Ricketson, Keith Murdoch and Robert Menzies in particular—had picked the right man. Lyons took his break with Labor hard but he was as ambitious as any who have over decades won the top job in politics. At first he thought enough of his Labor colleagues would join him to form a more Labor-dominated re-alignment. But only five Labor MPs went with Lyons. Catholics could choose to vote for the Catholic leader of what was left of the traditional ALP—James Scullin. Or they could support Lang-Labor whose Catholic leader was still in the New South Wales parliament. Or they could make the big leap and follow the devout Tasmanian Catholic, Joseph Lyons … Not surprisingly, the total ALP vote fell to an almost catastrophic 27 per cent, compared with the 49 per cent of the first preference vote which had elected Scullin in 1929. Middle-class Catholic voters would return to support Labor in strength in the 1940s, but the safety net of Catholic middle-class votes could no longer be relied on. With this sort of movement in the electorate, it was not surprising that the UAP in December 1931 won a landslide victory greater than that of Malcolm Fraser in 1975 in terms of the percentage of seats won. Over the decades, historians have ignored the impact of the Lyons government. Had Lyons come to office as the Catholic leader of the Labor Party and served three consecutive terms he would have gone into the tribal lexicon as the great Catholic figure who triumphed against the cultural odds. But he left his Labor tribe and was punished. By bridging the cultural and religious divides, however, the Lyons couple led ordinary Australians through their most troubled economic years. Under Lyons, Australia returned to relative prosperity and faith in good government, back from the brink of financial collapse and the civil unrest that had developed around Jack Lang. For Joe and Enid Lyons, their Catholic faith was never in doubt. But it was a private faith, one that saw Joe dash to mass at Albury in between changing trains on the way to Melbourne from Canberra or Enid playing the church organ or volunteering around her local Catholic parish. Their children all went to Catholic schools and colleges despite Joe Lyons’s opposition to state aid for Catholic schools. Such was the respect for the way they handled their faith, after Joe died in April 1939 Richard Casey generously provided the money for Joe and Enid’s son Kevin to finish his schooling as a boarder at the Jesuits’ Xavier College in Melbourne. As a reflection of those divided times, Casey admitted that, in doing so, he would have to “put aside residual anti-papist scruples”. 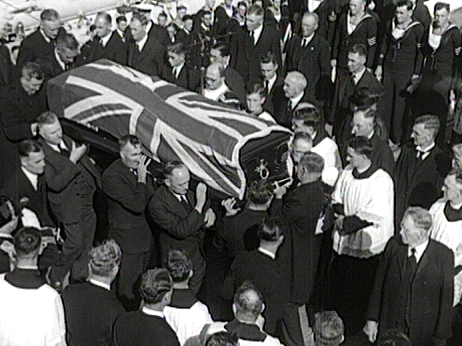 On Tuesday, April 11, 1939, as the cortege carrying Joe Lyons’s coffin (left) wound its way from St Mary’s Cathedral to the Quay, the streets of Sydney drew crowds to rival the funeral of a royal figure. Catholic and non-Catholic mourned Australia’s popular prime minister. One Sydneysider recalled decades later how, at the age of nine, he had watched the destroyer Vendetta, carrying Lyons’s remains to Devonport, as it moved down the coast off Maroubra. I hope that I shall never forget that everything that takes place in this chamber goes out somewhere to strike a human heart, to influence the life of some fellow being, and I believe this, too, with all my heart: that the duty of every government, whether in this country or any other, is to see that no man, because of the condition of his life, shall ever need lose his vision of the city of God. So it was that Joe and Enid Lyons flew under the sectarian radar. Anne Henderson is the author of Enid Lyons: Leading Lady to a Nation (2008) and Joseph Lyons: The People’s Prime Minister (2011) which was shortlisted for the Prime Minister’s Literary Awards for history. She presented this article as an address to the Christopher Dawson Centre for Cultural Studies in Hobart in April.